Would the world be a better place if carrots were as cuddly as they are crunchy? We have no idea. 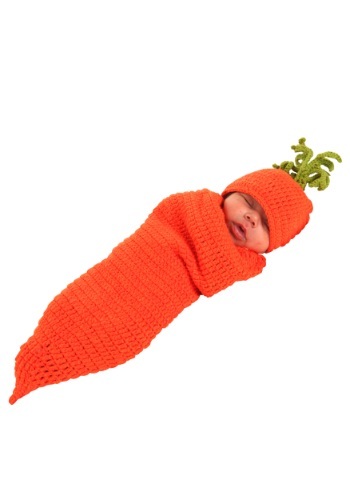 Could your tiny baby look any more adorable than in the hand-crocheted polyester yarn of this Carrigan the Carrot costume for newborns? That was a rhetorical question—we’re sure they would be just as sweet in any other outfit! But what other costume has a pointy orange nib at one end and a squishy green leafy top at the other? We’d actually like to get an answer to that one. As far as we can tell, Carrigan isn’t just the first name in carrot looks for little ones: it’s the only name. And we won’t rest until we find out exactly who is responsible for making us feel so conflicted between eating our vegetables and rocking them gently to sleep! Well, we’d have to take a little snooze if this snugly wrap came in our size. It just looks so comfy and warm! Exactly what we’d want for our first Halloween or a fun field trip to the local farmer’s market. A word of advice, though: be sure that nobody confuses your bundle of joy with any of the other fresh produce. It might sound crazy now, but wait til you see this cute root suit—people are going to eat it up! And if someone you know is planning to dress up like the Easter bunny (or some other famous rodent), consider adding Carrigan to the mix for a wholesome group costume!